SCS ETC USB-C Hub Aluminum Type-C Adapter offer a Type-C charging port with 100W Power Delivery Specification, HDMI 4K output, 3 x USB 3.0 ports, SD & TF card slot for simultaneous charging of the latest USB C laptop. 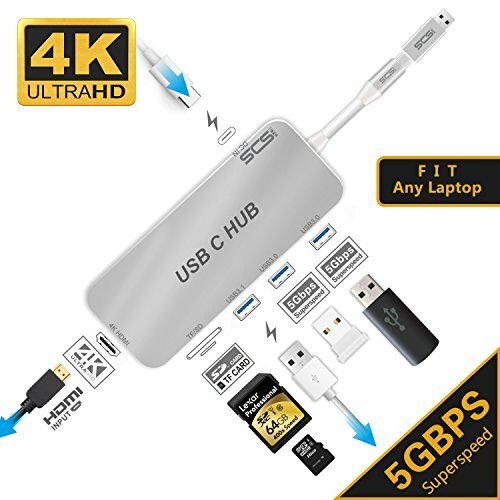 ♦Instant Expansion: USB Type-C Hub with charging port, HDMI 4K port, 3 x USB 3.0 ports, SD/TF memory card. Super-Slim Multi-port USB-C Hub. If you have any questions about this product by SCS ETC, contact us by completing and submitting the form below. If you are looking for a specif part number, please include it with your message.